MBM 54 is a faint molecular cloud located about 900 light years from our solar system in the outer regions of our galaxy. 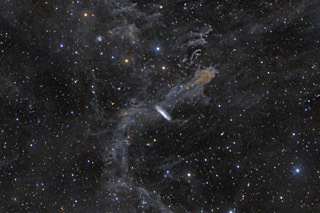 These types of clouds are found at high galactic latitudes (parts of the sky away from the plane of our Milky Way Galaxy) and are often referred to as galactic cirrus clouds or more commonly the "Integrated Flux Nebula". These clouds are very faint and quite tricky to photograph. Also shown in this image are numerous background galaxies including the prominent edge on spiral galaxy NGC 7497 (just left of the center of the image). At a distance of 59 million light years, this galaxy is over 60,000 times farther from us than the foreground MBM 54 clouds. Software Used Images Plus 5.75 for camera control. 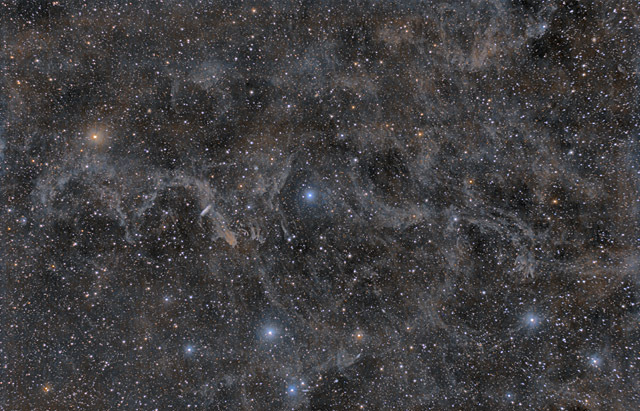 Images Plus 6.0 for calibration, stacking, digital development, star shrinking and halo reduction, smoothing and noise reduction, band suppression. Photoshop CS5 used for levels and curves, screen mask invert, high pass filter, lab color, selective color, match color, saturation adjustments, lens correction, and cropping. Pixinsight 1.8 for framing, noise reduction, and histogram transformation. HLVG for additional color correction, Gradient Xterminator for gradient removal. Carboni Tools for additional noise reduction and smoothing. Focus Magic for focus restoration. Registar for stack alignment. Notes This was a very challenging field of view to capture. Unfortunately, the nights I chose to capture this faint nebulosity were among some of the brighter nights I've had here. As a result, I had to invest a lot of time into photographing this field of view in order to keep the noise relatively low when applying the extreme stretching necessary to bring out the IFN. Nonetheless, I'm quite pleased with the final result as I think it shows an uncommon view of these molecular clouds. This image won first place in Astrophotogallery.org's Medium-Nebula category for November 2014.